Matt Cooke wanted to be a different player this season. Through 24 games, he's practically unrecognizable. The 33-year-old left wing made a name for himself for all the wrong reasons during his first three seasons with the Pittsburgh Penguins. He was suspended four times for hits that have been described as borderline, questionable or downright dirty. An elbow to the head of Rangers defenseman Ryan McDonagh cost Cooke the final 10 games of the 2010-11 regular season and all seven of the Penguins' first-round Stanley Cup Playoff games. Before that suspension was handed down by the League, Cooke knew that elbow to McDonagh's head was the end of the line. "Right as soon as it happened, you see me skating off the ice," Cooke said. "There was a realization at the time before I had my call, before I knew I had a suspension, that the only way to guarantee success was to change the approach from the start." Cooke vowed to change during the offseason, knowing that continuing to play on -- and over -- the edge could cause damage to his team and the careers of those in his path. He's delivered on that promise in stunning fashion, taking just four minor penalties -- hooking, holding, diving and an obstruction interference penalty -- after spending the summer watching video on his own and with the Penguins coaching staff in an effort to correct his game. The dangerous player who had averaged 101 penalty minutes per 82 games during his 12-year career is suddenly finding himself with numbers that rival those of Lady Byng contenders. "When it comes to the game, it's actually been pretty easy because I put a lot of time and effort into it last year," Cooke said of his transition. "During the final 10 games of the season and first round of the playoffs, I was preparing to play. I didn't get the chance (to return for the second round), but the work I put in there and throughout the summer enabled me to have success this year." 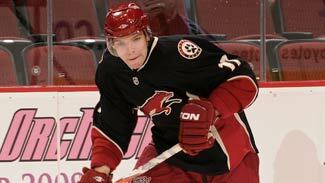 If Cooke wanted to continue his NHL career, he had little choice but to change. With new NHL Vice President of Player Safety Brendan Shanahan dishing out lengthy suspensions for hits that target the head, there's no telling what would happen if Cooke was to commit that type of infraction. Cooke's history of illegal blows to the head cost him 17 games last season, so it's not out of the realm of possibility to think an even harsher penalty could await should he go down that road another time. "I'm not that far removed or naïve enough to think that if something happened that I wouldn't get a larger suspension than I did last time," Cooke said. Has Cooke had to catch himself in certain situations and pull up on a defenseless player at any point this season? "I would say yes, in that I've not hit guys, but that's part of the approach," Cooke said. "My intention going to those spots is different than it has been in the past. I'm trying to get the puck as opposed to going for the biggest hit possible." Not only has Cooke avoided the dirty hit this season, but he's been contributing to the Penguins' success despite a sharp decline in his physical play. He has 32 hits through 24 games, putting him on pace for 109, which would be lowest total of his career. Cooke, however, is in line to have a career year in categories that don't involve crunching the opposition. He's on pace for 17 goals, which would be a career-high. He's seen an average of 1:36 of power-play ice time per game, the most time he's ever spent on the ice with the extra man -- although he hasn't seen a second on the power play since Sidney Crosby's return to the lineup four games ago. Cooke joked about his lack of extra-man time since Crosby's return: "There's a similar comparison (between him and Crosby), but I think he deserves to be out there." Cooke's 22 blocked shots lead all Penguins forwards, and that too is putting him on pace for a career best in that category. Flyers center Maxime Talbot, who was Cooke's teammate and regular linemate for three seasons before leaving for Philadelphia as a free agent this summer, said none of this is surprising. "Matt is a guy you can tell he can play the game," Talbot said. "Yes, he can throw big hits and be dangerous that way, but I think everybody knows he can play, and that's something that was always there. It's just the dangerous hits were something he needed to avoid, and now he's doing it. "When you put your mind into something, I think you're able to change. Matt, I think his last suspension really got to him. It really made him reflect. I haven't played against him this year, I haven't seen him play, but his numbers speak for themselves. He's been more disciplined. You know the refs are looking for him as well, so it's good for him. "I knew he could play. He's a smart guy." Penguins coach Dan Bylsma doesn't think this new Cooke is temporary. "I think Matt Cooke will be proving for a long time that he's playing within the rules and playing with a different mindset," Bylsma said. "He's certainly done a good job of that. He has a different approach. I think he's learned how to play the game within the rules and has that mindset. I think he's always going to do be proving that as he continues to play." Nothing Cooke does will ever erase the damage he's done in the past -- his elbow to the head of Boston's Marc Savard has put the center's career in peril and changed the landscape of hitting across the League -- but he's working to make sure history doesn't repeat itself. "I think you need to keep it there somewhere as a reminder to make sure I keep my understanding of what I need to do and how I need to play," Cooke said. "I don't think about it often, but I think it’s always there. "I wasn't going to make the NHL being a power-play guy. I had to bring something else. That's the way that I played; but now it's time for a few younger guys to come in and be the physical presence."